February, as most of the Western/English speaking world knows, is the month in which Valentine’s Day occurs. Ah, Valentine’s Day- or Singles’ Awareness Day as I like to call it- a day for lovers to express their true feelings for each other (usually through over-priced, commercialized items, but that’s a subject for an entirely different blog). Music is generally used when words alone aren’t enough. I, personally, am a big fan of romantic, lovey-dovey music. I have fantasies of Josh Groban or Michael Buble showing up at my door and serenading me before asking me to run away with them. I adore the old Frank Sinatra and Nat King Cole songs that used to fill the air at my great-grandmother’s house. But I digress. Love is the most common theme in modern music. Lost love, searching for love, celebrating love. Sometimes words by themselves just aren’t enough to express an emotion as powerful and timeless as love. So what songs do you think of when you want to express love? 1. “Love Song For No One” by John Mayer- I always feel drawn to songs like this. It’s like the artist is sending their love out into the void, just hoping that someone will send it back to them. 2. “So She Dances” by Josh Groban- One word comes to mind when I hear this song- adoration. The sensual inevitability of the love in this song never fails to wrap me up like a warm hug. I also loves how it weaves this love story just like a dance, flowing over and under and around. 3. “As Time Goes By”by Jimmy Durante- I love this song because it cuts through the surface elements of love like a kiss or a smile and gets down to the most important part- being happy and making that one special person happy. I think a lot of that is lost today, which is really quite sad. 4. “Everything” by Michael Buble- This is how I think true love should be- the person you love should embody every good thing in life. And on top of that, there’s such awe expressed in the chorus. This type of love never becomes a habit- it is always a blessing and, more importantly, a blessing that will endure. 5. 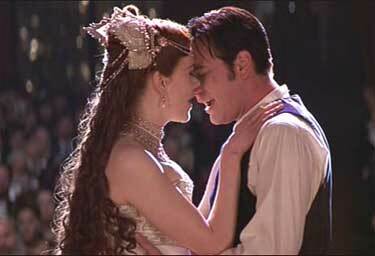 “Come What May” by Ewan McGregor and Nicole Kidman- True love should survive everything (even horrible things like tuberculosis and licentious rich dudes and death). Love should last forever- Amen. 6. “The Way You Look Tonight” by Frank Sinatra- I don’t exactly know why, but I’ve always found this song incredibly romantic. This love could exist for the length of one dance or it could last for eternity and whichever way it goes, the memory of that night will endure. 7. “Can’t Help Falling In Love” by Elvis Presley- Sometimes, falling in love is just inevitable. Logic and life have no say in it. Some things just can’t- or shouldn’t- be stopped. And no outside for can change that. It is simply a part of the natural order. 8. “If I Loved You” by Gordon MacRae and Shirley Jones- I’ve always loved this song because it is a denial of love even as it describes a very substantial form of love. And at the same time, it addresses the very real fear that we’ll miss out on love. If there really are soul mates, then if we wait to long, we could lose out on our chance at happiness forever. 9. 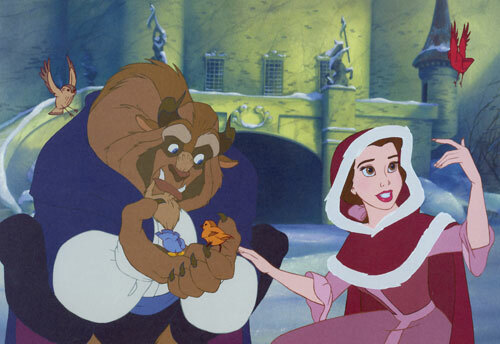 “Something There” from Beauty and the Beast– Love between friends is usually gradual in developing, but in my opinion, the most enduring love there is. Love involves a level of trust that I think demands friendship and this song expresses that magical moment where it becomes obvious that the affection of friendship has grown into true love. 10. “Accidentally in Love” by Counting Crows- Hmm…love can just sneak up on you when you least expect it. Go figure! What songs would be on your top 10 love song list and why?